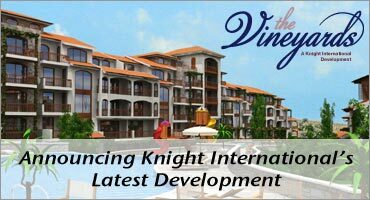 Knight International Announces the Launch of the Vineyards!! A unique new Bulgarian style development on the Black Sea coast. Included in the development are 230 apartments, 34 luxury two and three-bedroom villas and a 60 bedroom five-star hotel. Beautifully positioned on a hill with uninterrupted views of the Balkan Mountains and the Black Sea coastline it is just a few minutes drive away from the historic town of Old Nessebar, the spectacular beaches of Sunny Beach and a recently announced sporting complex, including an 18-hole golf course. The Vineyards marks a site of historical significance, where the battle of Aheloy was fought in the sixth century, and King Simeon the Great defeated the Byzantine State. This made the Balkan State an uncontestable dominion on the Balkan Peninsula. A museum to commemorate this event is planned as part of the development. According to James Knight, Executive Director of Knight International, 'we are committed to creating property developments for people to enjoy that are good for Bulgaria. That means aesthetically pleasing, kind to the environment and responsibly using the rich natural resources of the countryside. I believe that we have accomplished this with The Vineyards and have found some unique ways to acknowledge the great historical events that took place hundreds of years ago on this site that will increase public awareness of Bulgarian history and heritage." Knight International has over 20 years experience presenting international property sales and rentals. We are committed to long term relationships with our clients. We help guide you in making the right decisions offering only Bulgarian properties which are ideal for rental and investment. Our rental program is important because it will help you to cover the operating costs with rental income while your property investment in Bulgaria appreciates in value. Through our guidance we will also help you select prime Bulgarian properties and help you to avoid the disappointment that comes with buying something inferior. We offer only the best Bulgarian properties.